Deliver engaging and well timed communications across your organisation. As an Internal Communications team, you face the challenge of how to deliver engaging and well timed communications . Your intranet’s internal communication tools and publishing features need to provide engaging, targeted and relevant content but also need to give you a fundamental understanding of the information required by your organisations workforce to perform well, and of how this content is most effectively delivered. The variety of communication methods available can provide great opportunity to ensure your organisation’s knowledge and messages are delivered in innovative ways, however, you need to track how effectively this content has been understood, and have the tools to act to increase employee understanding. The in-place-editor provides a widgetised interface for arranging your landing pages and content. Quickly change the template layout without the cost and delay of waiting for IT suppliers. You can then easily tailor the look and feel using the ‘branding settings’ to fit the branding used throughout your organisation. Targeting of content can be achieved through metadata tagging options such as categories, topics, teams, locations and many more. Individual content widgets can be filtered to present content relevant to the person viewing the page. This helps to get the right information to the right people without having to hunt it down. 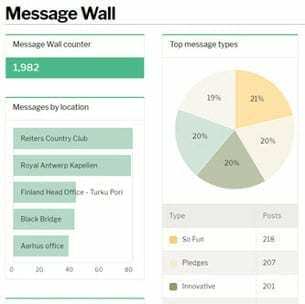 Dashboards are available throughout the product, presenting information about engagement. As well as dashboards we offer full integration with either Google Analytics or the well known open-source alternative Piwik, allowing you to track user engagement and daily interactions. Deliver confident, engaging and well timed communications across your organisation. Invotra delivers all of the content types you need for formal communication, whilst opening up informal collaboration with our range of social apps and features such as @mentioning, commenting and rating to ensure your colleagues feel part of their intranet experience. Use Invotra’s publishing, collaboration and analytic tools to quickly and effectively implement an enterprise level intranet. Features like in place editing of landing pages, granular control over targeting of content and our dashboards with integrated analytic tools allow you to confidently use our intranet to transform your intranet internal communication. Branding – Our brand management features ensure you are in control, with help and support from our onboarding and support team, you can make any necessary adjustments with ease. Analytics – Invotra comes with built-in analytics thanks to Piwik, the leading analytics system offering unparalleled security and rich reports. Custom reports and graphs visually show you where your intranet internal communication is performing well, and what content is less popular than it might be. Social – Encouraging the breaking down of silos Invotra’s enterprise social networking applications, including blogs, groups and our Message Wall, ensure collaboration and knowledge sharing is part of your organisational culture. 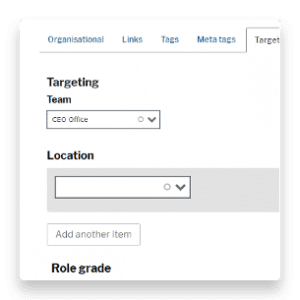 Content Targeting – Our content targeting feature provides the ability to target employees in specific teams, locations, role grades and region. Administrator dashboards – Inbuilt admin dashboards allow simple management of data and save valuable time.